Dimensions 1.25 by 8 by 10.50 in. An innovative cookbook that gives new life to the ancient processes of bread-making offers eighty-eight superb recipes for organic handmade breads, including traditional wheat breads and inventive variations. 35,000 first printing. $50,000 ad/promo. Tour. "Good bread is hard to find and easy to make," says Dan Leader as he draws you into the ancient world of traditional bread baking. 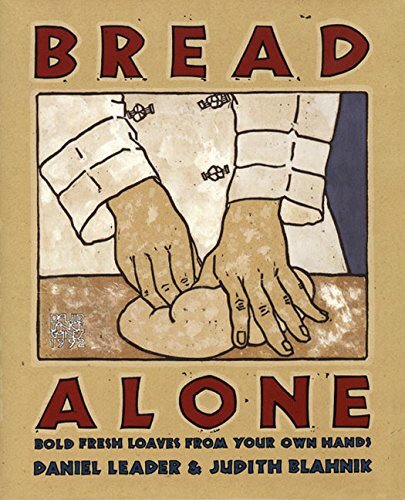 Unlike any other bread book, Bread Alone will provide you with a comprehensive guide to creatingâat homeâthe country-style breads that have consistently captured the imagination and the taste buds of the world. In a richly told tale, Leader chronicles his crossings of America and Europe to locate the most vital ingredients at the source, to learn from the methods of the world's great bakers, and to perfect their traditional techniques. His recipes are ones that have been used for centuries: large sourdough ryes, rich and dark raisin pumpernickel loaves, real French pain au levain, big round wheats with walnuts, crusty baguettes, high and airy breads, and more. Made from organic, stone-ground grains, these breads are slow-leavened, hand-shaped, and baked to perfection on heated baking tiles. As you read through the recipes, you can almost smell the ancient aroma of baking bread. And as you begin to bake, you will learn the importance of the primary ingredient in great bread: your own observations. In the chapter "Becoming Bread," you will learn to identify and shop for the highest quality flour available. And you will seek it out because you'll taste the difference. Making a poolish will become second nature to you as you master the Learning Recipe: Classic Country-Style Hearth Loaf and its delicious variations. Whatever your schedule, there is a bread for you. In the chapter "Straight-Dough Breads: Traditional Breads for a Modern Life-Style," you are shown how to start and finish a recipe in five hours, or morning-to-night, or night-to-night. You will bake sourdough bread in its many forms. By gently introducing the concept of sourdoughâhow it is made, how it is maintained, and how to get the best flavor from itâLeader demystifies it and makes it accessible to you. Discover the wonders of rye bread: From the dense and chewy Finnish Sour Rye to the fragrant Danish Light Rye, everyone's tastes are served. The mystery of pain au levain, French for "bread from a sourdough or wild yeast," unfolds into an understandable, user-friendly process. From My Personal Favorite Pain au Levain, a typical large Parisian loaf, to Pain au Levain with Pecans and Dried Cherries, the "Family of Traditional Pain au Levain" includes some of the best loaves baked around the world. A perfect baguette is a beautiful thing. From shaping to scoring, you will learn how to make the authentic French baguette at home. The purpose of an organic certifierâfind out how and why one farmer becomes dedicated to his role as land steward. Brioche, Chocolate-Apricot Kugelhopf, Panettone, and Semolina Sesame Rolls are a few recipes you will find in "A Family of Breads Inspired by Traditional French and Italian Breads." Finally, when a quick bread is all you have time to bake, you will find recipes for such delights as Vanilla Bean Butter Loaf; Dried Pear, Port, and Poppy Seed Loaf; and Provolone Sage Corn Loaf. Bread Alone is the bread book that cooks and bakers have been waiting for. From the wheat fields of the Midwest to the hot and steamy boulangeries of Paris, you will travel the long and delicious road to flawless bread baking. You will emerge a better baker and with a deeper understanding of what it takes to make perfect loaves. Bakers entertain you with stories of their love of baking (even in the most adverse situations). Bread Alone is the bible of bread books and a must-have for bread lovers everywhere.